If you need a custom boat tackle center or storage unit design we will create it for you using your specifications. Once we understand your requirement, we’ll quote a price based on the cost of all materials and our normal labor charges -- plus a one-time fee that covers getting your design into our CNC router's computer system. So, for example, if you need a pair of identical storage enclosures, the design fee only applies to the first one. If custom is the way you need to go, email or call us (305-743-4090 9 a.m. - 4 p.m. ET Mon - Fri) to get the ball rolling. 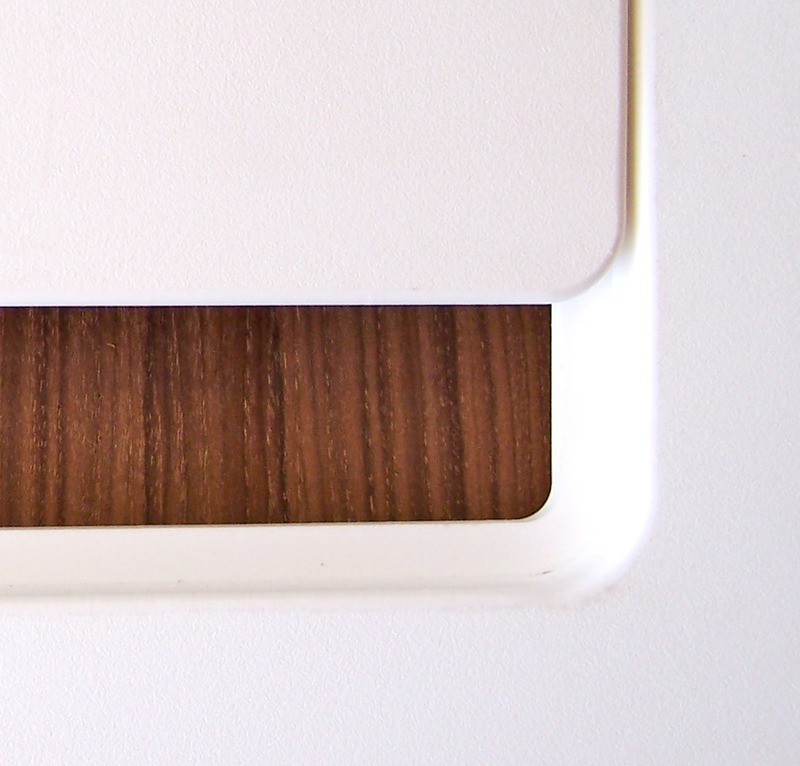 If you choose one of our stock designs as is, you’ll pay only for the stock unit itself plus whatever options you might want in the way of pre-drilled frames, latch types and so on. 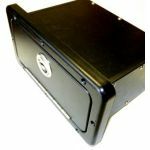 This can potentially save you hundreds of dollars off the cost of a custom-quality instrument or storage box, tackle center or other enclosure. “Just a quick note to commend you on an excellent job. The unit (stock glove box) is better than expected. And the packing -- what can I say!" We can also modify several of our stock designs at reasonable cost. 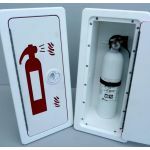 For example, if you have an existing enclosure cutout that’s somewhat larger than what’s specified in one of our stock models, we can probably enlarge the enclosure’s frame to work with the cutout you have. We can often adapt existing designs to fit other requirements. The top-left enclosure shown here is an adaptation of the smaller enclosure design on the bottom-left. Basically we piggy-backed two of the smaller units and surrounded them with a frame that matched the customer's cutout requirement -- and created a four-drawer enclosure at considerably less than the cost of creating a custom four-drawer unit from scratch. So if you see one or more of our stock designs that you think might be adapted to suit what you have in mind, by all means call us as 305-743-4090. Or email john@buckwoodcraft.com with your requirements, and we'll get back to you as soon as possible. All our enclosure frames are milled from 3/4"-thick King Starboard, and typically are cut to either 1.5" or 2" in width. The inside edges are then routed out to accept 1/2"-thick door panels or drawer fronts, all set flush with the frame's face. Door panels usually King Starboard. The result is a clean, low-profile look, with nice tight tolerances between the frame and enclosure panel elements. Depending on the enclosure size and type, we attach inset panels to the frame with either stainless steel piano hinges (which is the norm), or electro-polished stainless steel face hinges. Either way, the hinges are sturdy and stylish. 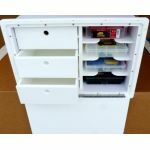 We build your enclosure frame, door panels and drawer components in your choice of five King Starboard colors at no extra cost: White/White, Black, Sea Foam, San Shade or Dolphin Gray. 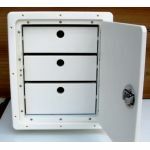 Unless otherwise specified, the enclosure carcass is built using white PVC in order to save weight. 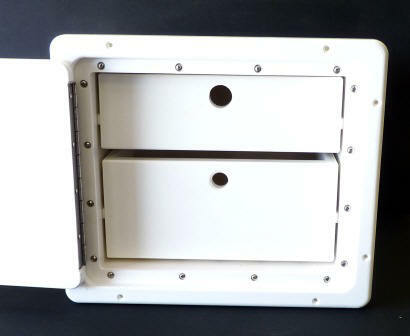 No Extra Cost -- This white Southco non-locking polylcarbonate latch is a standard option on our enclosures. It's handsome, tough, and designed for the marine environment. No Extra Cost -- Or choose this black Southco non-locking polycarbonate latch, again as a standard option. Just as with the white version shown above, this latch will stand up to the harsh conditions of a marine environment. Add $28.00 -- And upgrade to this non-locking GemLux electro-polished stainless steel slam latch. Stylish and durable. Add $38.00 -- And add security to your enclosure with this locking GemLux electro-polished stainless steel slam latch. Add $25.00 -- Consider this option if you need to fasten your enclosure frame from the front, rather than screwing into it from behind. We'll pre-drill and countersink your holes at precisely spaced intervals on our CNC machine -- so there's no guesswork or uneven results.